On 7/7, Andy Murray ended a 77 year drought with his victory at Wimbledon. He became the first player from The United Kingdom to win Wimbledon in 77 years. Murray has come close before, losing in the championship match just 365 days prior. This year however, Murray was victorious by a score of 6-4, 7-5, 6-4. It was a straight set victory over Novak Djokovic that lasted just over 3 hours. Djokovic no doubt is a tough opponent, as this straight set win had the feel of a 5 set marathon. The final game of the match lasted for what seemed like an eternity. Djokovic fought off match point after match point, until finally, on his 5th championship point, Murray prevailed. Seconds after Djokovic put a backhand into the net, a roller-coaster of emotions ran through Andy Murray. He immediately turned to his coaching box and through his adrenaline felt excitement beyond his wildest dreams. He put his arms in the hair and clutched them with a powerful feeling that he came within inches of just a year earlier. He then turned and embraced Djokovic and congratulated him on a fine effort. From there it was a surreal moment that I’m sure even Murray can’t put into words. He fell to his knees and put his head in his hands on the grass. He had done it. He had reached the pinnacle of his tennis career, and all he could feel was pure elation. This certainly was a fine year for Mr. Murray. 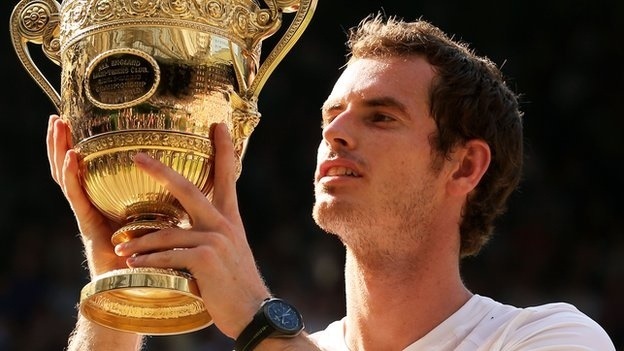 Since his loss at Wimbledon last year, Murray has won a Gold Medal, he was the runner-up to Djokovic at the Australian Open, and he won the U.S Open. I’d say it’s pretty good to be Andy Murray right now. into the U.S. Open as the defending champion and will look to improve on his already stellar year. Behind Murray’s vast improvement and breakthrough at Wimbledon has been one man; Ivan Lendl. Murray hired the former tennis great on New Year’s Eve of last year and since then has taken his game to the next level. The relationship between Lendl and Murray appears to be solid and should last slightly longer than that of Connors and Roddick (haha). How has Lendl helped Murray take his game to the next level you ask? Well, one thing Ivan Lendl will never be confused with is a circus clown. What I mean by that is Lendl is all business all the time. With Lendl there is no time for fun, there is only time for winning. He has helped Murray keep his emotions in check. See, it is easy with the talent of an Andy Murray to make it to the quarter finals or semi finals of Grand Slams consistently, but it is another thing to win multiple Slams. That aspect of championship tennis is strictly mental (and it is also has a little bit to do with your conditioning). What fans don’t always realize is how important the mental component is at the professional level. Lendl has apparently found a way to clearly illustrate this to Murray. The only question now is can Lendl and Murray have continued success as a coach-player tandem? It is also fair to ask if Murray will repeat as U.S. champion? Tell me what you think in the comment section below. Thanks!